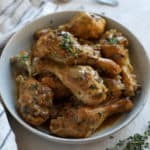 Slow Cooker Dijon-Thyme Chicken Legs are simple to make and sure to please the whole family. In a large skillet or Dutch oven over medium-high, add 1/2 Tbsp. ghee or avocado oil. When the oil is hot, add chicken legs and cook 3-4 minutes on each side until lightly browned. Remove chicken and place in the bottom of the slow cooker. Repeat with remaining chicken. To make the sauce, add Dijon mustard through black pepper (i.e. Dijon mustard, broth, dates, cumin, thyme, paprika, salt & black pepper) in a small bowl and whisk to combine. Alternatively, you can blend the sauce in a blender. Pour sauce over chicken in the slow cooker and toss chicken to coat each piece with sauce. Place lid on slow cooker and set to LOW heat. Cook 5 hours or until chicken is cooked through. Remove chicken to a plate to keep warm. Strain remaining sauce through a fine mesh strainer into a small saucepan over medium-high heat. Bring sauce to a boil and reduce heat slightly to produce an aggressive simmer/low boil for 5-10 minutes or until slightly thickened. Taste and season with salt and pepper to taste. You may further thicken the sauce with a bit of arrowroot starch mixed with cold water if desired (how much you need will depend on how much liquid you have).